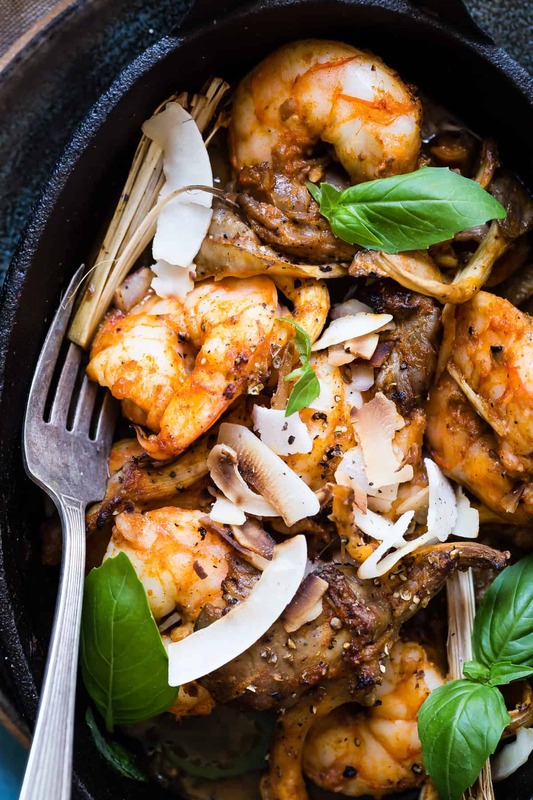 An easy appetizer made by baking giant shrimp in a red curry sauce with oyster mushrooms! 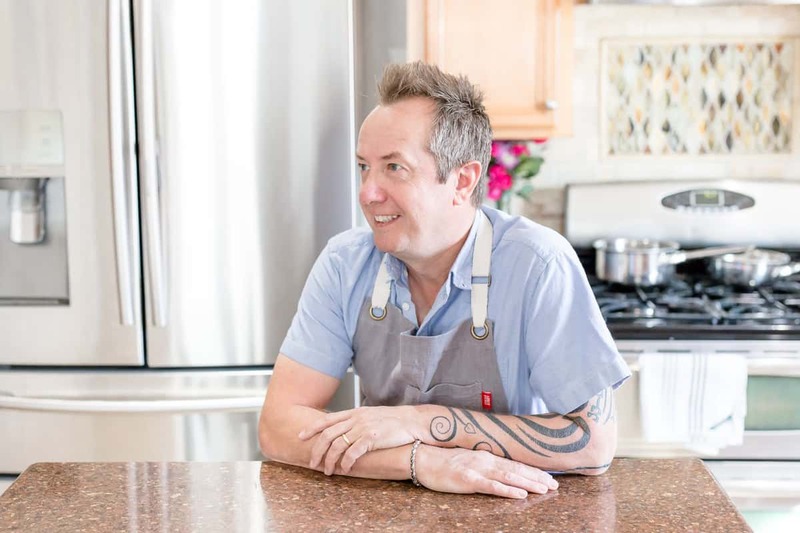 In fact, so simple you might end up making it as a main course. 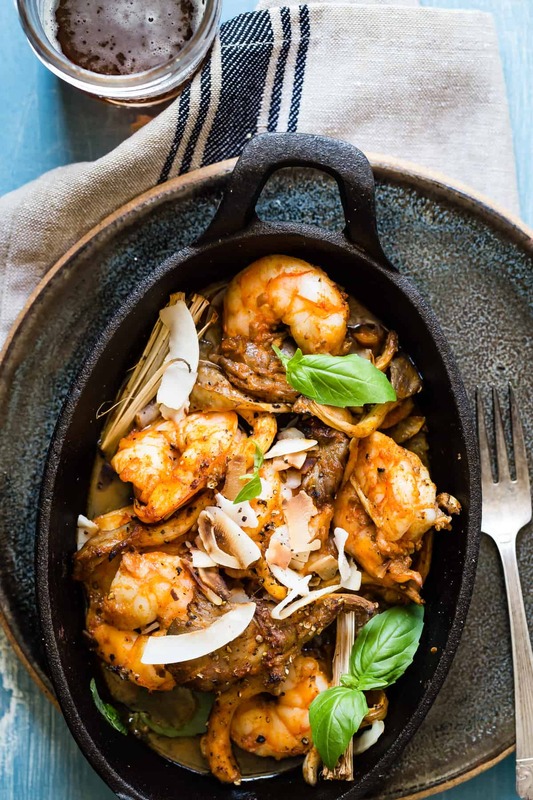 I have a weak spot for coconut milk and it’s creamy sweet flavor and I think you’ll love this, especially if you use those giant shrimp, not the teeny sad ones. I’m still on a major seafood kick even after eating bucket loads of the stuff weeks ago on our family vacation along the east coast. I’ll be recapping that trip soon, I promise, but so many photographs! If you like shrimp as much as me, type the word in the search bar to your right and you’ll see a whole bunch of choices pop up for you. Spicy Dynamite Shrimp Bowls and Lemon Shrimp Risotto are just a couple that I’d recommend. And don’t sweat the red curry paste, you can pick it up easily enough at almost any grocery. Once you mix it with the creamy delicious coconut milk the heat will be less spicy and you’ll be left with a fragrant easy sauce that’s worthy of having some crusty bread available to soak it up! 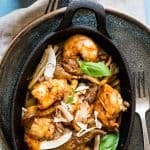 Lemongrass and basil along with toasted coconut flakes will give you all the feels and those juicy oyster mushrooms are so much tastier than regular button mushrooms. You could serve this as is or throw in a dollop of brown rice but I don’t think you need to, and I made this with feeding two in mind, but it’s seriously so good that after shooting it I ate pretty much all of it. And I didn’t feel guilty at all! Shake the coconut milk well to mix and add 3 tbsp of it into a bowl. Add the fish sauce, curry paste, minced garlic and black pepper and whisk to combine. Add the shrimp, mushrooms and lemongrass and toss well to coat in the sauce. Transfer the mixture to a small cast iron pan or oven-safe dish. 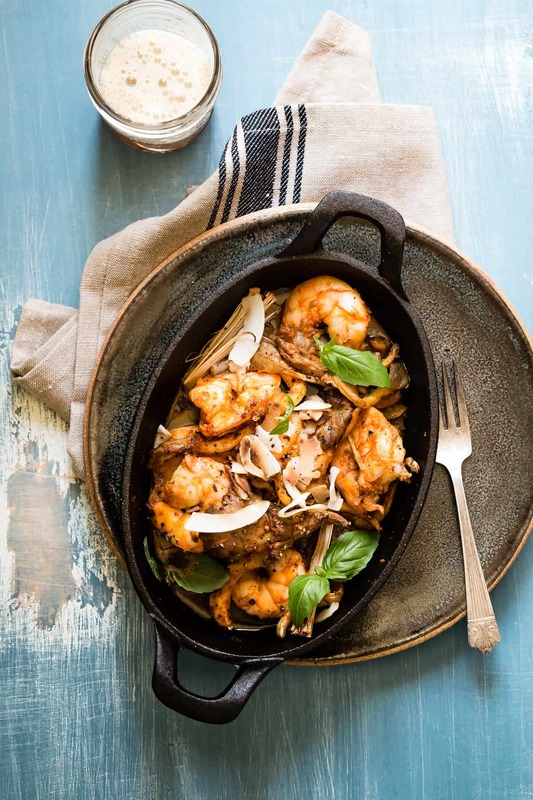 After the shrimp are cooked, pour the remaining two tbsp coconut milk over the shrimp and serve with fresh basil, toasted coconut flakes and crusty bread. So I never thought to add toasted coconut flakes! That’s perfection for this curry dish? Can’t wait to try it it! I know we love seafood and curry! I love the flavors in this! Lemongrass is my new obsession! I can’t wait to give this a try! YUM!!! Will have to try this out! Ooh, yum! Love it with the oyster mushrooms! I love red curry, this is such a great appetizer idea! Curry is the BEST! This looks like the perfect meal.